The cast of Top Gun 2 continues to grow. Today, we bring you the news that a couple of heavy-hitters have joined the sequel, in addition to an up-and-coming star who has a solid foundation. Former Mad Men star Jon Hamm and the legendary Ed Harris, who recently starred in HBO's Westworld, have both joined the ensemble of the upcoming sequel. Unfortunately, at the present time, the nature of their roles hasn't been disclosed. Despite that, they bring some big star power to the project. In addition to Jon Hamm and Ed Harris, actor Lewis Pullman has also joined the growing cast. His resume has been growing as of late, having starred in Strangers: Prey at Night, as well as having a role in the upcoming Drew Goddard movie Bad Times at the El Royale, which also boasts an impressive cast. He also happens to the be the son of actor Bill Pullman, star of movies such as Independence Day and Spaceballs. Similar to the other new additions to the cast, there's no word just yet on who Pullman will be playing. This comes not long after several other new cast members were added to round out the cast. 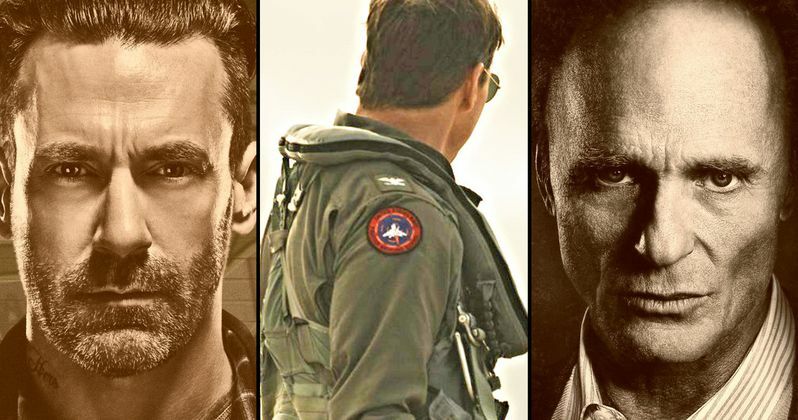 As we recently reported, Charles Parnell, Jay Ellis, Bashir Salahuddin, Danny Ramirez and Monica Barbaro have all also joined up for the sequel, which is officially titled Top Gun: Maverick. The new report indicates that Thomasin McKenzie, who had also been cast, had to bow out for scheduling reasons. She was set to play the daughter of Jennifer Connolly, who will play the female lead. Other new cast members include Miles Teller, who plays the son of Anthony Edwards' Goose and Glen Powell, who initially auditioned for Goose's son but was given a different role. Tom Cruise will once again lead the way as Maverick in Top Gun 2. Paramount has yet to release a full synopsis, but the movie will center on Cruise's character training a new generation of fighter pilots, taking Goose's son under his wing. The movie will also focus on the increasing reliance on drone warfare in the modern battlefield. Val Kilmer will also be on board to reprise his role as Iceman from the original 1986 classic. To ice the cake, Kenny Loggins will be recording a brand new version of Danger Zone with a contemporary artist for the soundtrack. Joseph Kosinski, who previously worked with Tom Cruise on Oblivion, is in the director's chair. The original plan was to have Tony Scott come back prior to his passing in 2012, which put the movie on hold for a handful of years before it picked up steam again. Production on the sequel is underway currently. We'll be sure to keep you up to date as more details on the project are made available. Top Gun: Maverick is set to arrive in theaters on July 12, 2019. This news comes to us courtesy of Deadline.